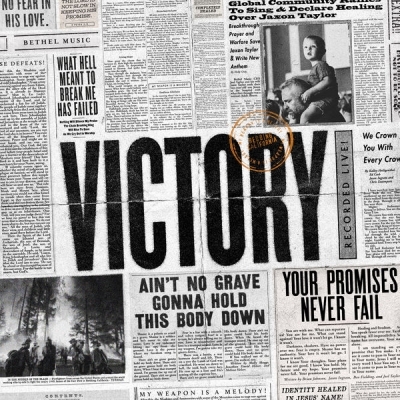 Bethel Music will release its latest album 'VICTORY' on January 25th, featuring 14 confident, declarative songs recorded live at Bethel Church. Four new songs taken from the album are available from today; 'Raise A Hallelujah' by Jonathan and Melissa Helser (see video below), 'Goodness of God' (Jenn Johnson), 'Ain't No Grave' (Molly Skaggs), and 'Victory Is Yours' (Bethany Wohrle). Miracles, a raging wildfire and a joy-filled adoption; battles with anxiety, fear and health - enter Bethel Music’s newest record Victory debuting Jan. 25, 2019. Known for anthems like “No Longer Slaves,” “One Thing Remains” and more, this awaited collection reminds the listener that Bethel Music is a community of real people traversing life’s challenges and triumphs, just like those on the other end of each song. Victory harkens back to the story of King Jehoshaphat and the unlikely victory won by sending worshipers to the front lines of battle - a testament that has been essential to the Bethel Music Family throughout the last 12 months. A pillar of Victory is the miraculous account of now three year-old Jaxon, the son of Bethel Music CEO Joel Taylor. Only 12 months ago, Jaxon was hospitalized with Hemolytic-uremic syndrome (HUS) caused by an E. coli infection - an illness that shut down his kidneys, and caused seizures along with other life-threatening complications. "Last Christmas, we almost lost our son to a battle with a deadly disease,” shares Joel. “We spent five-weeks of sleepless nights in the hospital by his side as our prayers became our weapons and our worship became our warfare. In the battle for his life, the global church community rose up like a mighty army and joined us in prayer and worship all over the world. Our son was miraculously healed and today is perfectly healthy. For us, Victory has become a declaration of truth over hopelessness, a prophetic statement in the storm of adversity, and a battle-cry when facing the impossible. The battle belongs to our God, and our God is victorious!" Faithfulness is interlaced throughout each of the 14 songs including Josh Baldwin’s grounding “Stand In Your Love,” Cory Asbury’s inviting “Endless Alleluia,” Jonathan Helser’s illuminating track “Raise A Hallelujah” and Jenn Johnson’s “Goodness Of God,” a track born out of the Johnson Family’s (Brian and Jenn) recent adoption. Victory brings forth new music from additional beloved members of the Bethel Music Collective including Melissa Helser, Bethany Wohrle, Sean Feucht, Emmy Rose, Brian Johnson, Kalley Heiligenthal, Paul & Hannah McClure and Hunter GK Thompson. The collection also invites fresh vocals from friends including Molly Skaggs, Daniel Bashta & Harvest. For the first time in over a year, Bethel Music is hitting the road for an extended “VICTORY Tour” with Tasha Cobbs and Housefires. The initial two month trek will visit Miami, Austin, Vancouver, Los Angeles and more. The fall run will visit Chicago, Nashville, Brooklyn and other markets.